I was in a rush last night and needed something quick and hearty that I could make for lunches the rest of this week and next (the last two weeks I’ll be working in an office—starting June 8, I’ll be working from home and will hopefully have a lot more time to cook and try new recipes!). So I pulled open the fridge and freezer to see what I had on hand that would cook up quick and easy and be super tasty. 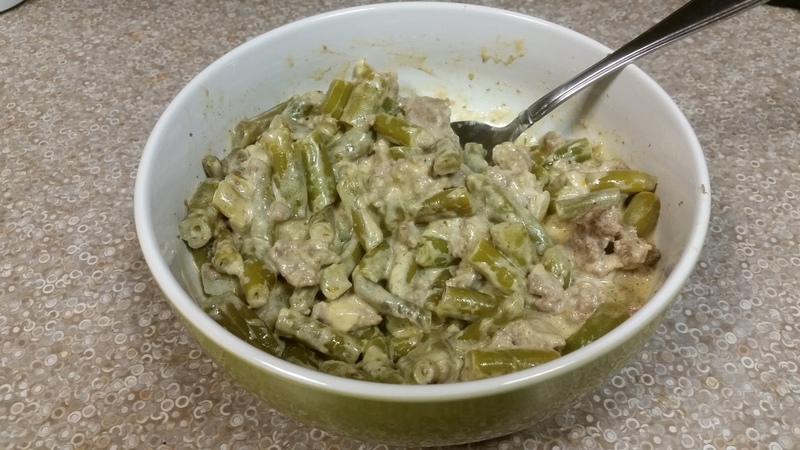 Beef Stroganoff is something that most of you who grew up in the 1970s, like I did, are going to be somewhat familiar with. Except you’re probably accustomed to having it over egg noodles. Not low-carb friendly. 😦 But there’s a great way to make this with out the noodles—and get a veggie serving in while you’re at it! *There are recipes online for home-made, lower-carb substitutes for canned soup. But this is what I had on hand and I wanted something quick. In skillet over medium to medium-high heat, cook ground beef until almost browned. Drain off fat. Return meat to skillet and reduce heat to medium-low and add onion and garlic powder. Cover and let cook 10 to 15 minutes**, stirring occasionally, until meat is cooked through and onion is soft and translucent. **While this is cooking, place the two bags of green beans in the microwave and cook on high 5-6 minutes. They should still have some crunch to them—they’ll continue cooking later. Add sour cream, soup, cayenne, oregano, and paprika to skillet and stir to combine with meat/onion mixture. Bring to a simmer (you may need to increase the heat to medium if you’re in a time crunch). Add green beans and stir to thoroughly combine. Bring back to a simmer. Taste and season with salt and pepper (you’ll probably need more salt than you realize, but add it in small doses). Cover and let cook over medium-low heat, stirring occasionally, another 10-15 minutes. Taste and re-season if necessary before serving. Makes five to six servings. Based on six servings, each serving is 10.7g net carbs. This is a good basic recipe that you can do lots of different things to. Spice it up with Tony’s or other Cajun/Creole spices. Try curry powder instead of paprika. You can also add different or additional veggies to it—try it with steamed cauliflower or use zucchini noodles instead (just don’t add the zucchini noodles until 2-3 minutes before serving so they don’t get mushy). Add sliced mushrooms. Just don’t forget to calculate your new carb totals for whatever changes you make!